The Lindsay Paper Box Co., Ltd. is pleased to announce that it has become the very first litho/offset printer in Canada to be awarded the Target Certified Supplier designation! Following a rigorous company wide audit carried out by GMI (Graphic Measures International), Lindsay Paper Box earned the highest initial score ever given to a packaging supplier. This certification will allow us to print any paperboard packaging for use in Target stores. The Lindsay Paper Box Co., Ltd. has always believed in the three "R"'s - Reduce, Reuse & Recycle. All of the material used in the manufacture of our custom folding cartons is either recycled, or is recyclable paperboard. All excess material is returned to the paper mills to be made into new cardboard. Keeping with its' mandate to be environmentally friendly, the company recently upgraded their pre-press department with a new Heidelberg SupraSetter CTP device that uses no harmful chemicals to produce printing plates. The new Saphira Chem-free printing plate technology eliminates all of the chemistry normally used to develop print plates. 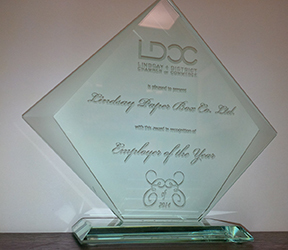 This is a direct reduction in the company's carbon footprint. Additionally, Lindsay Paper Box has converted the printing inks used to the only EcoLogo certified printing ink on the market. Through a partnership with Heidelberg Canada, Lindsay Paper Box has examined internal manufacturing processes and has switched and/or eliminated many products that were not as friendly as they could be. The new Saphira Bio Ink is a small step towards improving the environmental sustainability of the company. 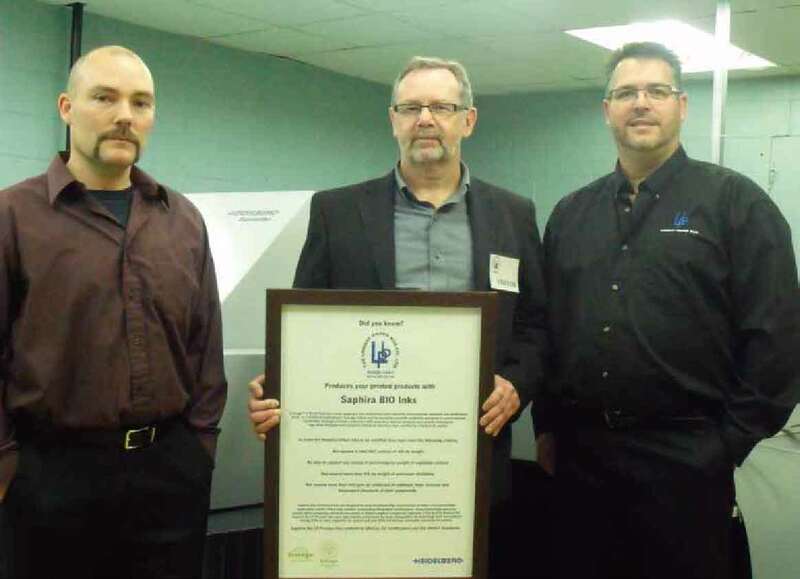 Richard Armstrong, President of Heidelberg Canada, presents Greg Fierheller and Tim Raven, owners of Lindsay Paper Box with a certificate outlining the environmental credentials of the Saphira Bio Ink in front of the new CTP device.